Sorishar tel-e khasir kalia / Mutton curry with mustard oil is my Goalondo Chicken curry inspired Mutton curry. I have nt used any Garam masala here to keep flavour of mustard oil. Mustard oil was used to use vastly as cooking oil about 30 year. Nowadays it is not that popular for its higher price till there are same dishes where mustard oil is a essential ingredient. Enjoy. Clean and wash mutton and place in a strain to get rid of water. Mix mutton in cooking pan with garlic, ginger, onion, chilli powder and turmeric; keep it aside at least for half hour. Add oil, bay leaf and ½ teaspoon salt; cook over medium heat till oil is separated and all water dries out. Add green chillies and 2 cups of water (or as per your taste more or less) and cook it under closed lid till mutton is tender. Check the salt and remove from heat. 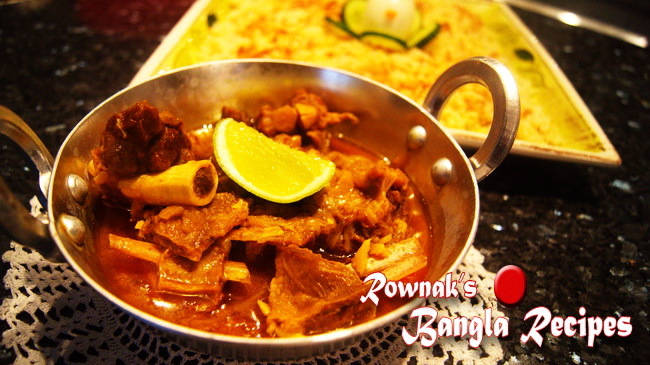 Serve Sorishar tel-e khasir kalia / Mutton curry with mustard oil with fresh hot rice. Ginger, garlic, green chillies need to be fresh. Dear Apu, as salamu alaikum. In 4 no of How to make, 2 cups of what? Sorry for typo. It will be 2cups of water.